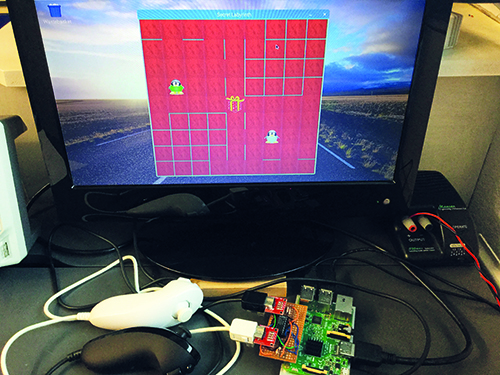 Wii Nunchucks with Raspberry Pi #piday #raspberrypi @Raspberry_Pi « Adafruit Industries – Makers, hackers, artists, designers and engineers! The Secret Labyrinth is hard but intriguing. It can be played as either a two-player or single-player game. The players begin at opposite corners of a maze and have to find the centre by using a series of horizontal and vertical moves controlled by a Wii Nunchuk. But the twist is that you can’t see the walls in the maze: if you walk into a wall then you are instantly whisked back to your starting point. There are no player turns – just move as quickly as you can – and the maze is constructed so that the path from the bottom to the centre is the mirror image of the path from the top to the centre, so both players face an identical task.